Welcome to Université Sainte-Anne, the only French university in Nova Scotia. It may be a surprise to discover that this small community has its own university. 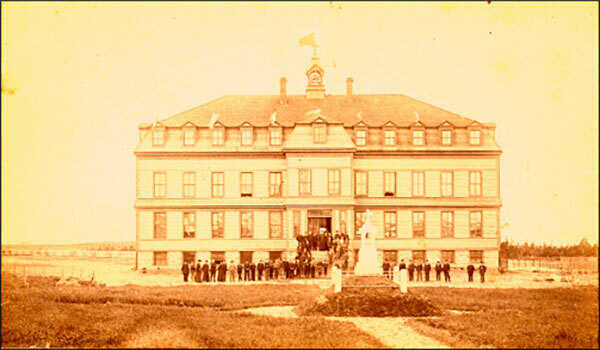 The school was founded in response to the 1864 Nova Scotia Education Act that required public schools to operate in English. The Education Act limited the educational options of francophones in Nova Scotia. The Acadians of Baie Sainte-Marie decided to set up a school that would educate their children in both French and English. 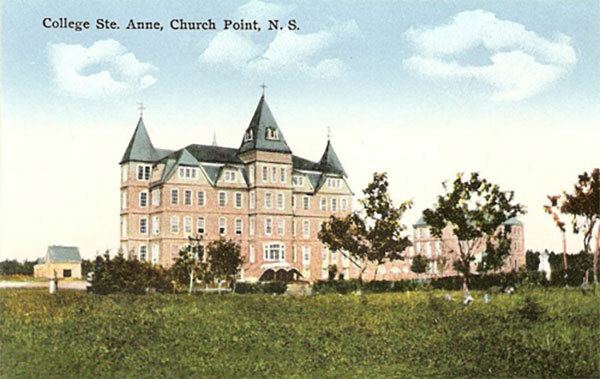 Collège Sainte-Anne was built on 100 acres of land between Route 1 and the ocean. The local community donated the materials and the labour for the buildings. During the school’s first eighty years, its teachers were Catholic priests of the Eudist order from France. The college’s main building (Édifice Gustave Blanche) was designed by architect William Critchlow Harris and built in 1899 under the direction of a local Acadian carpenter, Leo Melanson, who also built the neighbouring church (Église Sainte-Marie). It’s ironic that Leo had not gone to school and could neither read nor write. The college was a boarding school for boys and operated on the model of the French ‘collèges classiques’ offering all of the school grades and university subjects leading to a Bachelor’s degree. It welcomed its first four female students in 1961. The college changed its name to Université Sainte-Anne in 1977. In 2003, the university merged with the Collège de l’Acadie, Nova Scotia’s network of French language community colleges. Université Sainte-Anne now has about 300 full-time and 550 part-time students, and operates five campuses in Nova Scotia. It is well known internationally for its French language immersion programs. 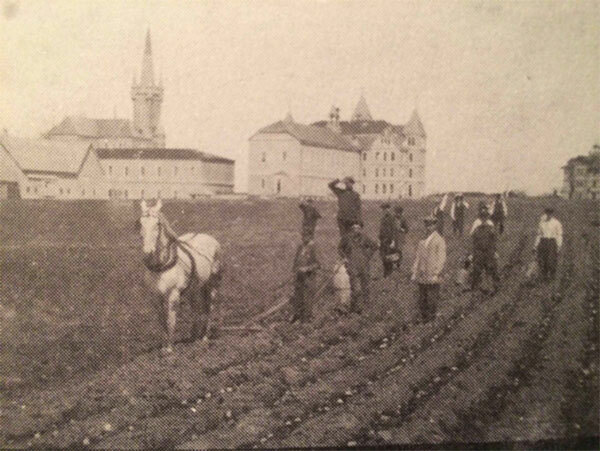 Université Sainte-Anne celebrated its 125th anniversary in 2015. A webcam located in the steeple of the Église Sainte-Marie gives a bird’s eye view of the campus in real time. Église Sainte-Marie stands on the northern edge of the campus. It is the largest wooden church in North America and the second largest wooden church in the world. It was completed in 1905, and today it is both a parish church and a museum. The steeple is 56.4 meters (185 feet) tall and is ballasted with 40 tons of rock to prevent it from the effects of strong winds. Over 1,500 parishioners donated their time to build this church. The church’s museum displays a wide variety of gold and silver vessels, elaborate vestments and other artifacts. If you have the time, it is well worth a visit. Follow the link below to a vertigo inducing twelve-minute aerial video of the campus and its surroundings, photographed using a remote-controlled drone. 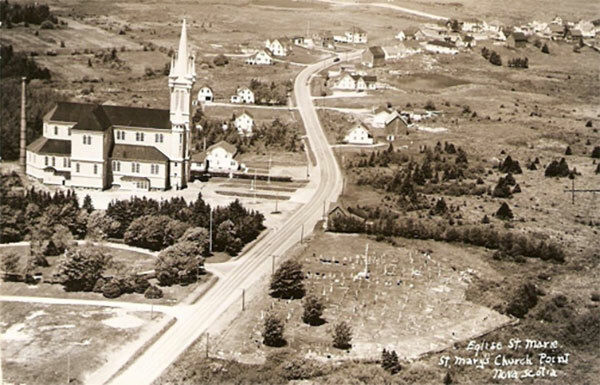 The flight path rises up and over the church steeple and travels over the campus and Le Petit Bois, offering spectacular views of Baie Sainte-Marie and the campus hinterlands. For more information about Université Sainte-Anne, visit the university’s website. For more information about Église Sainte-Marie, visit the church’s website.